The F8004 (Portable) and F8104 (Continuous Monitoring) Multi Air Testers are the ideal tool when you need to test to medical standards EU Pharmacopeia and HTM 02-01 or breathing-air standards such as EN12021. 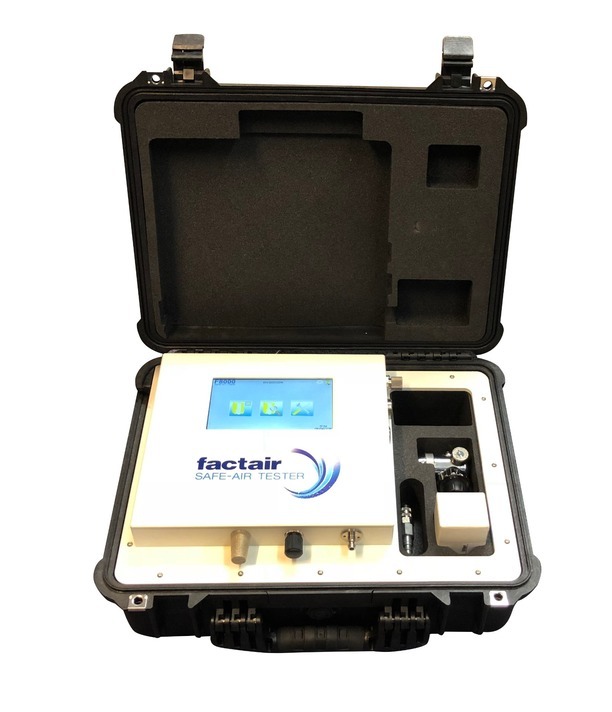 These instruments utilise electronic cells to test nitrous fumes, sulphur dioxide, carbon dioxide, carbon monoxide and oxygen with a PID sensor for volatile organic compounds which can include oil vapours and a test port for oil mist using the Draeger Impactor. Moisture is automatically measured with a built-in electronic dewpoint meter and there are digital readings for pressure, flow rate (portable only) and ambient temperature. The continuous monitoring instruments utilise similar detection technologies to the portable units but also include a range of alarm output options as well as SMS alarm and sensor reading updates. These instruments can also be connected to display, datalog and alarm on readings from external instruments. As an alternative, the F4504 is available, for medical, surgical and dental air this instrument can test to the requirements of EU Pharmacopeia and HTM 02-01. It also can test against the Pharmacopeia parameters for CO2, N2 and N20 supplies. For breathing-air applications the instrument can test to the requirements of EN12021.